Potatoes flakes are made in a continuous process. The potatoes enter the line whole and unpeeled, and come out as weighed and packed flakes. Potato flakes are flat chunks of dehydrated mashed potato. How are they made? Potatoes are cooked and mashed, then crushed by rollers on the surface of a drum. The mashed potato is fast-dried until its humidity reaches the desired level, then the layer of dried, mashed potato is scraped from the drum. 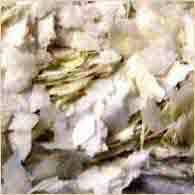 This sheet is broken up by a mill sifter, and the resulting flakes are then packed. Although many of the potato cells are broken during production, the texture of the reconstituted product is kept firm by blanching, subsequent cooling, and the use of an additive, a monoglyceride emulsifier. This process was developed in Philadelphia between 1953 and 1959, and is now used the world over. These flakes are the main ingredient in pre-mashed potato sold in food stores, and are also an important ingredient in other food products. The flakes are very easy to rehydrate: the potato starch retains its considerable absorbency, because the flakes are produced by dehydrating them in one quick phase. Out of all the forms of dried potatoes, flakes are the only one that can easily be reconstituted using cold water, which is why they are used to make so many food products. Thinking about a production line for potato flakes. If you are thinking about a production line for potato flakes, bear in mind that each kilo of finished product requires six kilos of unpeeled potatoes. What level of production are you after? Let us know the capacity per hour, day or month. Given that this type of facility can operate for days and even weeks on end, it has the potential for 6,000 hours of production per year. Treating this as a new investment, we assume that you already grow and store potatoes. Please give us confirmation of this. If you aim to buy potatoes: Are you sure that you can get a daily supply, possibly every two or three hours? If that is not the case, we have to estimate how much storage buffering would be required to cover the periods without supply. Would you like us to prepare you an additional quote on this storage? How many harvests are there in your region each year? During which months do they take place? Which varieties of potatoes are you thinking of using? If necessary, would it be feasible to swap to varieties that are more suitable for the process? Could you let us know the dry content of the potato variety? They should preferably have above 20%, and never below 18%. Do you already have a guaranteed market, or do you need to create one? By "market", we mean a group of local, national and international buyers. 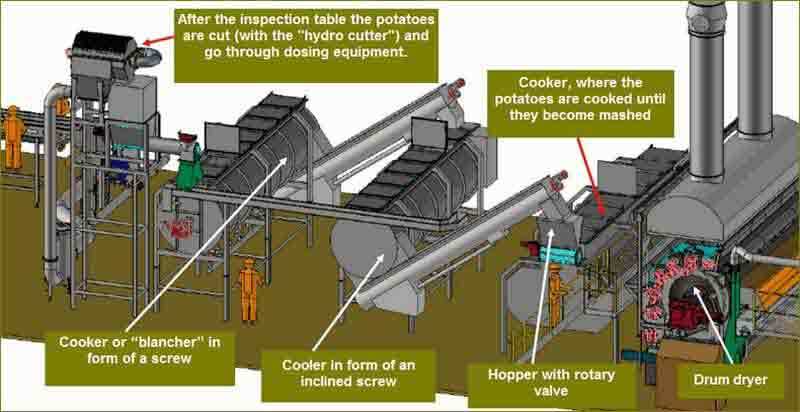 Short guide to a potato flake production line. The unpeeled potatoes leave the warehouse and enter the production line on the left. On the right, the flakes come out weighed and packed for sale to the consumer or to the industry that uses them as an ingredient in another product. To make things clearer, we have divided this image into three parts, with a short description of each step of the production line. The potatoes are fed into a machine that separates them from any stones and sand that might be in the batch, through flotation (potatoes float, sand sinks). Just one stone among the potatoes could cause serious damage to these machines. Next, the potatoes are peeled using water vapour. Once they have been peeled, their skin is separated and the potatoes are washed, before passing through a quality inspection table. Following a visual quality inspection, the potatoes are cut using a hydraulic machine known as a hydro cutter, and the sliced potatoes are then dosed into a blancher that pre-cooks them. Once cooked, the batch of sliced potatoes are cooled in a spiral cooler. The cooking, cooling and addition of a monoglyceride emulsifier is what gives the final product its desired texture. Due to the relatively low capacity of the drum dryer, many lines will have two or more working at once. There are three dryers on this line. Once the layer of mashed potato is dry, it is scraped from the drum and moved via a current of air through a pipe to a mill sifter; there are three on this line. This breaks up the flakes into similar sizes. The flakes leave the mill sifter, and go straight to the packing machinery. Given that the flakes have to be made in a continuous process, this type of facility requires a significant investment. 90% of potato flakes are made in industrial facilities like the one described on this page. 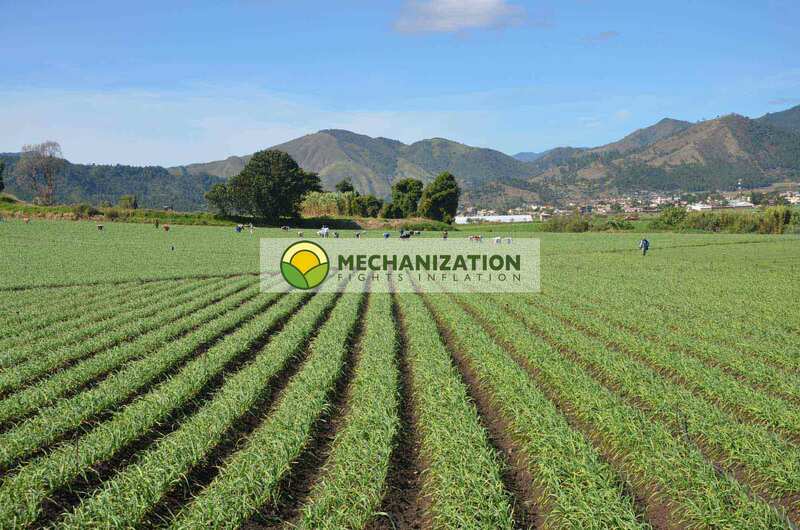 To evaluate an investment in one of these production facilities, visit: Valuing a potato flake investment, and enter the data into our Tool for analysing mechanisation costs, then see how much this facility will cost you per kilogram of flakes produced. On the right hand side of this page, we give a straightforward description of the processes that are used to turn potatoes into quality potato flakes. Ninety per cent of potato flakes are made industrially.